How do I Build Muscle Quickly? 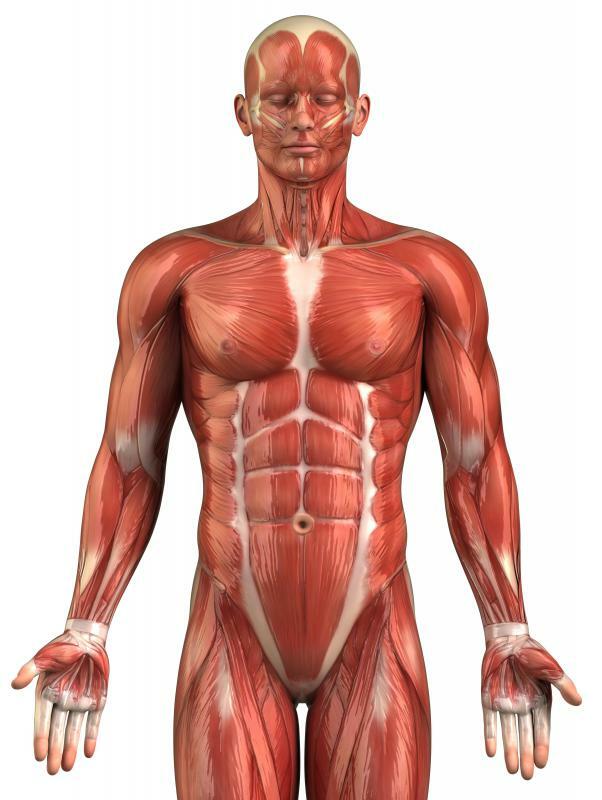 Learning about the muscular system can help a bodybuilder understand how to build mass properly and at a quicker pace. Protein is essential for those who wish to build muscle quickly. Weight lifting is a quick way to build muscle. Building muscle is a goal that many individuals, men in particular, tend to share; it increases physical strength, improves appearance and tends to boost one's confidence. Sometimes, it becomes important to build muscle quickly for any of a variety of reasons, such as to prepare for a job or sport that is particularly physically taxing. Some also may need to quickly prepare for the role of a muscular character in a play or movie. Whatever the reason, to build muscle quickly, one must maintain a healthy, protein-rich diet and an intense, rigorous schedule of exercise with a strong focus on weight lifting. Diet is a very important part of muscle building, as the body needs specific nutrients to produce muscles. Protein, in particular, is essential for those who wish to build muscle quickly. Eggs and meats are good sources of protein and will help build muscles and provide energy throughout the day. Carbohydrates are also very important because the body uses them to fuel the energy needed for exercise and other day-to-day activities. Pastas and whole-grain breads are both excellent sources of carbohydrates that provide a great deal of energy without excessive and unhealthy sugar. Just adding protein to one's diet in the form of eggs or meat generally isn't enough to build muscle quickly. It is sometimes helpful to add protein supplements to one's diet, as they contain amino acids that can be very helpful for building muscle. Protein supplements come in a few different forms. Some people favor protein bars, as they are quick and convenient, while others favor protein shakes because they can control the amount of protein they add. While balanced meals are very important for building muscles, extra protein is absolutely essential for those who wish to build muscle quickly. Exercise is also very important; the size of muscles will not increase if the muscles are not used. Free weights are particularly effective, as they put a significant amount of stress on the muscles and signal the need to increase in size and strength. Free weights often provide a more rigorous workout than weight machines do, but weight machines are also viable options for increasing muscle mass. Some important exercises that build muscle quickly can and should be done without weights. Pull-ups, squats, and crunches all work muscles that are difficult to work through the use of weights. They also improve muscular endurance and increase stamina. It is important to take a day of rest for every two or three days of intense exercise. Working out tears the muscles, and they need time to reform and to grow. Not giving muscles time to grow and heal can result in injury and generally will not help build muscle quickly. What Is the Relationship between Protein and Muscle Building? What are the Different Types of Exercises to Build Muscle? What are the Best Ways to Build Muscle Mass Fast? In Weight Training, what is a Lateral Raise? Not everybody reacts the same to the same foods. If you are eating a certain food that works for most people, but you are not seeing any muscle gain then try something else. You may also need to vary your exercises, the routines you use, if you are not getting the desired results. Whatever foods you choose, you're probably going to have to increase your intake of calories considerably, so don't wait until you are hungry to eat. Set an eating schedule and stick to it. Six to eight meals a day should help you in your quest to build muscle mass quickly. One of my favorite ways of loading up on protein when I was working out regularly and trying to build muscle was eating lots of tuna. The fish is loaded with protein and it's good for you. However, like the article says, tuna might not be enough and you may need to add protein supplements to your diet, depending on how quickly you want to gain muscle mass. Don't become dependent on the supplements. Protein loaded whole foods are still the best way to build muscle and maintain a healthy body. Drink plenty of water before you work out, while you are working out and after you work out. Muscles are larger comprised of water, and dehydration is a serious concern when you are working out regularly. Consider carrying a water bottle around with you throughout the day, and continually sipping from the bottle.